I have always loved singing and wanted to master my voice so I could achieve my full potential. My problem was that I thought I had a ‘low’ voice. This really restricted the songs I could sing comfortably and therefore left me feeling frustrated and confused as to why I couldn’t reach higher notes. Whenever I tried to sing high I would strain and feel very vocally fatigued. I could ‘fake’ it during performances but I was left feeling exhausted and worried about my range. It wasn’t until I discovered a technique called Speech Level Singing that I was finally taught how the voice worked, the function of the vocal folds, larynx, breath and registers. I didn’t have a ‘low’ voice after all! I was just stuck in my chest voice; a very common problem. Wanting to understand my own vocal limitations led me on a journey of study that I have been on for over 15 years and will continue for the rest of my life. The voice is a fascinating subject and as vocal technology advances so does our understanding. The mysteries that have surrounded singing can be solved scientifically. We now know that there are different modes of phonation. We understand what needs to happen to the vocal folds to change pitch and reach those high notes. Ingo Titze, to name but a few. Prince, Michael Jackson, Stevie Wonder, Ray Charles, Madonna, Johnny Hallyday and Barbra Streisand plus many many more. I studied this technique for over 15 years. It was during this time that I began to take charge of my voice and realise that I had to sing with technique rather than pure instinct. I had to have a plan for those high notes; I had to think about Sub-glottal pressure, vocal fold thickness and breath flow. I started making a real difference to my students’ voices and my own- I was hooked and began studying voice science and vocal pedagogy. 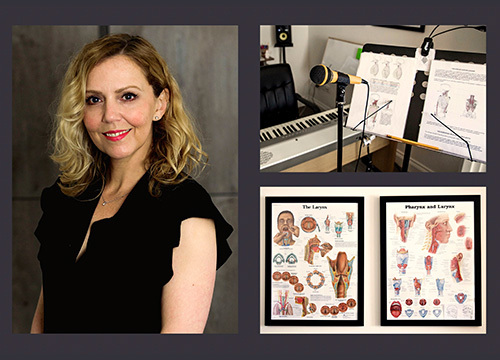 I have most recently completed an intense singing teacher accreditation with Gillyanne Kayes, author of Singing and the Actor and co-founder of Vocal Process. I trained as an actress and a singer at The Academy of Live and Recorded Arts in London and upon graduation enjoyed many years of performing both nationally and internationally. There is nothing like performing live with great musicians and I have been in the fortunate position of earning my living out of singing every night, on tour and in studios with a variety of different bands and music producers. I have also written original material for myself and others and continue to do so.